Please contact me regarding the 2012 International DURASTAR 4 CAR CARRIER - Stock# CL626857 for sale at TruckerToTrucker.com. 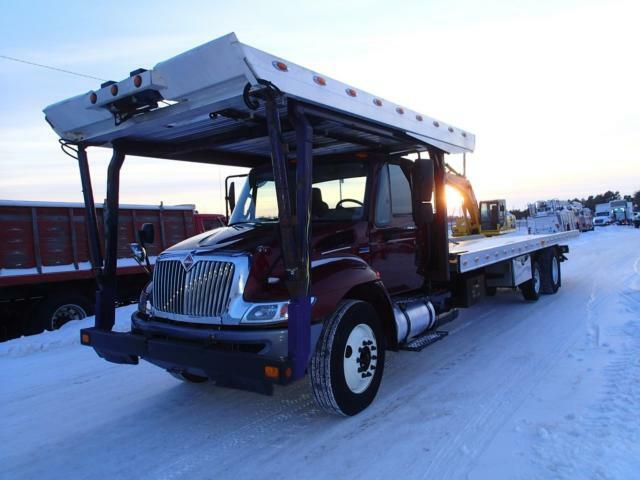 Take a look at this 2012 International DURASTAR 4 CAR CARRIER. It is Stock# CL626857 at TruckerToTrucker.com. 2012 INTERNATIONAL ROLLBACK OUTFITTED WITH ALUMINUM 4 CAR CARRIER BEDS - TOP BED IS 13 FT 6 IN LONG AND 8 FT 1.5 IN WIDE AND SPLIT INTO 3 CHANNELS BY 4 X 4 ALUMINUM RAILS. THE BOTTOM SECTION IS 29 FT 10 IN LONG AND 8 FT 1 IN WIDE WITH A 3 FT OVERHANG THAT HAS A 4 FT 7.75 IN CLEARANCE. THE TOP BED HAS A GROUND TO TOP OF RAIL HEIGHT OF 9 FT 4 IN. THE BOTTOM BED HAS A GROUND TO TOP OF RAIL HEIGHT OF 4 FT 5 IN. TOP BED IS EQUIPPED WITH A WINCH AND THE BOTTOM IS EQUIPPED WITH 2 WINCHES. HYDRAULIC CONTROLS AND AMBER LIGHTING. SIDES OF BEDS CONTAIN CHAIN SLOTS AND D-RINGS. WHEEL LIFT MOUNTED IN BACK. TRUCK ALSO EQUIPPED WITH SAFETY CHAIN AND WORK LIGHTS. FOR MORE DETAILS CONTACT JEFF OR TOM.